We introduce a fully automatic algorithm which optimizes the high-level structure of a given quadrilateral mesh to achieve a coarser quadrangular base complex. Such a topological optimization is highly desirable, since state-of-the-art quadrangulation techniques lead to meshes which have an appropriate singularity distribution and an anisotropic element alignment, but usually they are still far away from the high-level structure which is typical for carefully designed meshes manually created by specialists and used e.g. in animation or simulation. In this paper we show that the quality of the high-level structure is negatively affected by helical configurations within the quadrilateral mesh. Consequently we present an algorithm which detects helices and is able to remove most of them by applying a novel grid preserving simplification operator (GP-operator) which is guaranteed to maintain an all-quadrilateral mesh. Additionally it preserves the given singularity distribution and in particular does not introduce new singularities. For each helix we construct a directed graph in which cycles through the start vertex encode operations to remove the corresponding helix. Therefore a simple graph search algorithm can be performed iteratively to remove as many helices as possible and thus improve the high-level structure in a greedy fashion. 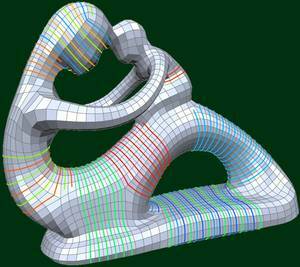 We demonstrate the usefulness of our automatic structure optimization technique by showing several examples with varying complexity.